This is a self indulgent post. Today, October 10, 2010, marks the 10th anniversary of the day I became an organic chemist. Life works in mysterious ways. October 1999, I was miserable. I was finishing up a master’s degree in inorganic chemistry and was telling anyone who would listen that 1) I would never, ever get a Ph.D., and 2) I wanted nothing to do with chemistry ever again. It’s embarrasing, ridiculous, and so utterly cliche, but at the time I thought I wanted to be an artist. A few weeks later I got on a plane to Cairo and made no plans to come back. By late December 1999, I’d travelled all through Egypt, Jordan, and parts of Syria and then made it down to Jerusalem where I was staying at a friend’s place in French Hill. Looking through the dusty bookshelves of his apartment, I pulled down an old book. 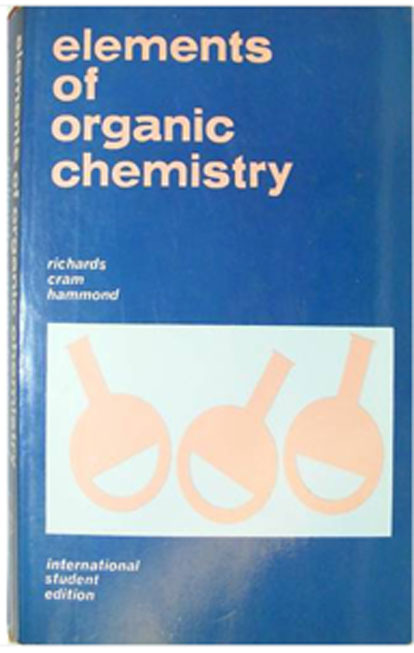 It was “Elements of Organic Chemistry” by Richards, Cram, and Hammond. 1968. I leafed through it. I always *did* like organic chemistry, I thought. “Mind if I borrow this?”, I asked. “It belongs to the old Russian guy who owns the apartment but I don’t think he’d miss it”. I lugged that fricking book all through Israel, then to Cyprus, Syria, and Lebanon. It sloshed around at the bottom of my backpack and I never once opened it. Then, in April, I got stuck in Beirut. Long story short: I lost my passport and had to get a new one. Losing your passport in the Middle East: not advisable. I was staying in a cheap hotel by the shore and had a few days to kill. Bored, I pulled out the old chemistry book and read it cover-to-cover. Loved it. I tried to put all the reactions I’d learned about together in my mind. Then I put them on a sheet of paper. This stuff is just beautiful. Forward to September, 2000. I’d moved to Montreal. Living by myself off of dwindling savings, I was spending entire days in the libraries at McGill, reading books on science, poetry, literature, everything. 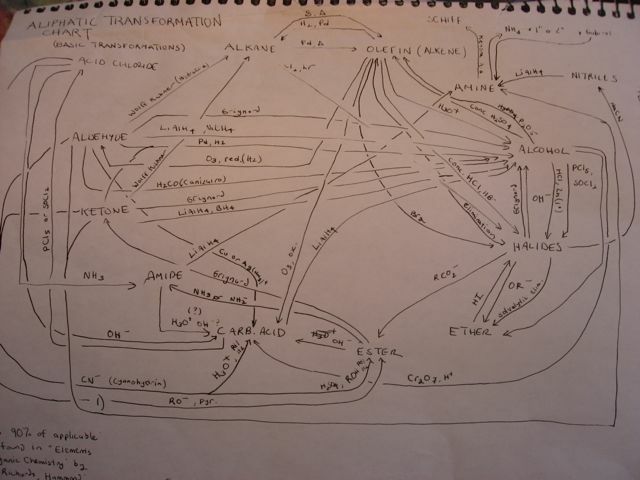 I came back to organic chemistry. I started going through bigger textbooks. To make sure I understood it, I’d go through the problems. I didn’t have to do it for a course. I was doing it for fun. I could have done anything, but I chose to do that. But I needed a job. I started thinking about everything I could possibly do. I really liked biochemistry, astronomy, physics, photography, all these things – but it was just going to take too long for me to make a career out of them. Then it hit me – I could train as an organic chemist somewhere and probably get a decent job within a year. I knew the pharmaceutical industry in Montreal was hiring organic chemists like crazy. But my practical skills were poor. I’d need someone to show me the tricks. All my time at school I had this mental block – that organic chem was something that really smart, motivated, hard-working people did, and I had convinced myself over the years that I was none of those things. The thought that I could actually be an organic chemist had never really hit me until that day, and it was electrifying. I’ll give it a shot. Even if I’m the world’s worst, I can live with that. If it doesn’t work out, I can always try something else. A month later I found myself visiting professor’s offices at one of the local universities. “Just so you know, my lab skills are pretty much zero”. So October 10, 2000 was my first day in the lab as an organic chemist. For a time, I probably was the world’s worst. I’ve done pretty much every dumb thing in a lab you can possibly do. But being new at something is actually pretty liberating. You’re expected to make mistakes. You can ask “stupid” questions. People’s expectations are low. As long as I worked my tail off and learned from my mistakes, my colleagues were really forgiving. I still can’t believe how lucky I got to be put in that environment: thanks to their kindness, generosity, and savoir faire, I grew and grew. Ten years later, I’m back in Jerusalem and the bench chemistry phase of my life seems to be winding down. But due to the explosive growth of the Internet, it’s now possible to imagine a career where I could make a (very) modest living through talking to people all over the world about organic chemistry on an individual basis, as well as writing an educational website. None of that would have been feasible ten years ago. I have no idea where this new direction will lead, but it excites me. Although there have been many tough times – the poor job market for chemists has been particularly difficult to come to terms with – I still feel extremely lucky and thankful to have been able to follow this path and do something that I love, especially at this time and place. Thanks for reading. And to my fellow Canadians – Happy Thanksgiving! Well, James, I’d say it worked out pretty well for you. Even if I did scare the daylights out of you when I put a boatload of dry ice in your rotovap when you weren’t looking. Good times! I’ve tried that trick on at LEAST 5 noobs and have never obtained anything close to the same response you got from me. Disappointing. Man, you went through one of the craziest paths of life! I want to let you know that I am inspired by your story. I am an undergraduate student and I often feel burned out of chemistry or have mental blocks. Sometimes I do dumb things in the lab or make silly mistakes on tests, but as you said I shouldn’t be afraid to ask “stupid” questions and more importantly, learn from my mistakes and get better! Thank you for your post, James. You have a very powerful story!